This whole adventure began for me with the SH-101. My all time favorite mono synth. The synth that opened up so many doors for me. I wrote my love letter to the SH-101 and compared and contrasted various modern mono synths as comparable versions of a single oscillator, monophonic synthesizer for sale today and tried to share the spirit of just how deeply loved the synth is by me, and by many people. Little did I know that Roland had a modern version of their own up their sleeves. I just noticed the love letter on Facebook. I’m happy you have the users guide. I love this boutique so much. It feels nicer than the ju-06 and the jx-03, and it sounds amazing. I did check out the manual and even though it is better I still hate the unfolding format. Great job! Nice! Are you going to do one of these for the JP-08 too? @Tres – I already did. Thanks man! You are really helping so many people with this. So proud to be your friend. Have you done the 03 yet? @Lawrence Eduardo – I don’t have the TB-03, so I don’t think I could do one for it. I wouldn’t undertake a manual for something I didn’t actually have and know. But should I ever luck into one, then yes I absolutely would. You are selling me on this. I need to read this. I want to love this box and checked it out at the synth store, but couldn’t immediately get my head around it enough to fall in love. Not on the first date anyway. @Whitsitt – I can understand that Whitsitt. I think my enthusiasm immediately comes from my pre condition: I love the SH-101. And so in the modern world, where software and fancy synths are big and full of crazy features immediately the idea of moving knobs, and learning about sound synthesis and exploring subtitles may not be immediately thrilling. Having written that out there I start to get excited and want to get back to work… because that’s what I do. When I play a show, I am doing exactly that. So it’s what makes this so fun and such an adventure for me. It’s different every time. It’s a new discovery every day. I love it. I hope my re written manual helps show you the way. Are you thinking about a Sunshine’s Epic Tips tome on all the eurorack modules you have? @Donovan – Eurorack is a wonderful world I am deeply invested in. I LOVE eurorack modular synthesizers. I think that there are a lot of wonderful videos and guides and so much healthy and vibrant dialog on this subject that before I produced a guide for Eurorack, I would urge people to head over to muffwiggler and join the community. I learn so much there every day. @Peter – Hahahaha… We can still be friends. I get quitters all the time. Our time will come. @Cisco – That’s a lovely thought, but it wouldn’t be the same if I did this for money or things. I do this for love. Repay me by making music! Play live! Join me. Thank you sooo much for this! Sunshine Jones you are a truly beautiful human!!! Thank you!!! Many thanks for taking the time to publish this manual. It is greatly appreciated, and to me is superior to the original. Thank you so much for the advanced LFO breakdown was looking everywhere for it! Everything about this manual is awesome thank you! thank you for this! I’m very excited to play around with the advanced LFO mode. Hi thanks for the manuals. 1 thing, you can arp one note, just push the arp button and c1 high or low, one of them will give you the one note arp. an inspired update to a near 90’s classic. @ALX – doesn’t that give us an octave arpeggiate? I’m gonna have to try this and see for myself… thanks! @John – Well documented. Thank you. I imagine that setting up a controller with the ability to send CC and have it remember the keys and settings (like the A-49 or my Emu Xboard) would totally make using these extra modes a lot more than just an experiment. I’ll pull the Xboard down and set something up and play around with it. Thank you. I’d like to program a sequence on the 01A, then transpose the sequence as it plays, but i find i have to hold the transpose button in whilst i play the keyboard. Is there a way to keep the transpose button held in so i have both hands free? 1. I don’t think that how the SH-01A is designed is a fault or an oversight. Rather, I think this is more about the ergonomics and performance nature of this wonderful little synth. So it is all accessible from right there. I’ve had endless fun playing with it like this, but I do know what you mean about needing both my hands during transposing. Totally. This will allow you to send Midi CC data to the SH-10A from a sequencer or perhaps a keyboard which will automate transposing of the sequences. 3. I believe that with the K25-M connected you can hold down the transpose key and then play a key on the K25 and let go, and it will play in the newly assigned key, and to go back to the programmed pitch you just touch the transpose key again and it’s back. Really engaged and live and fun. 4. A really novel way to handle transposing with all of the boutiques is by using the Retroktis RK-002 cable. I’ve got one and it’s dope. Before the cable is useful we need to load up the pitch bend transpose firmware available at retrokits web site, and then connect the cable between the boutique device and the sequencer or controller keyboard. What this cable does it it allows whatever keys are played into the boutique to operate as a pitch shift for the sequence playing. This is really amazing for the original boutiques (JU-06, JP-08, and JX-03) because they didn’t come with any ability to pitch shift at all, or even chain together sequences, so it’s a wonderful missing link for these things. for my SH-01A I would probably do as I have been doing, and that’s handling transposing live as described in example 3 above. But there are a lot of ways to accomplish this. Experiment, and please come back and express what finally worked best for you? My other option here is to record the midi notes coming from the sh01a into ableton – can do that fine, but when i transpose the sequence, the incoming midi notes in ableton aren’t transposed. Is it possible to do this? I’m wondering if Midi CC77 is actually the transpose switch – not the transpose sequencer button? @ Tom – Interesting. Perhaps CC 77 is just the basic transpose function. Try this: Set the transpose to be + – 2 Octaves, and then program a sequence. While the sequence is playing, send MIDI CC 77 and a value of 2 to the SH-01A. You should hear the sequence transpose up 2 semitones. It’s true, this does use the pitch transpose feature to change the pitch of the notes, it’s not a formal “sequence transpose” function, but it should do the job. 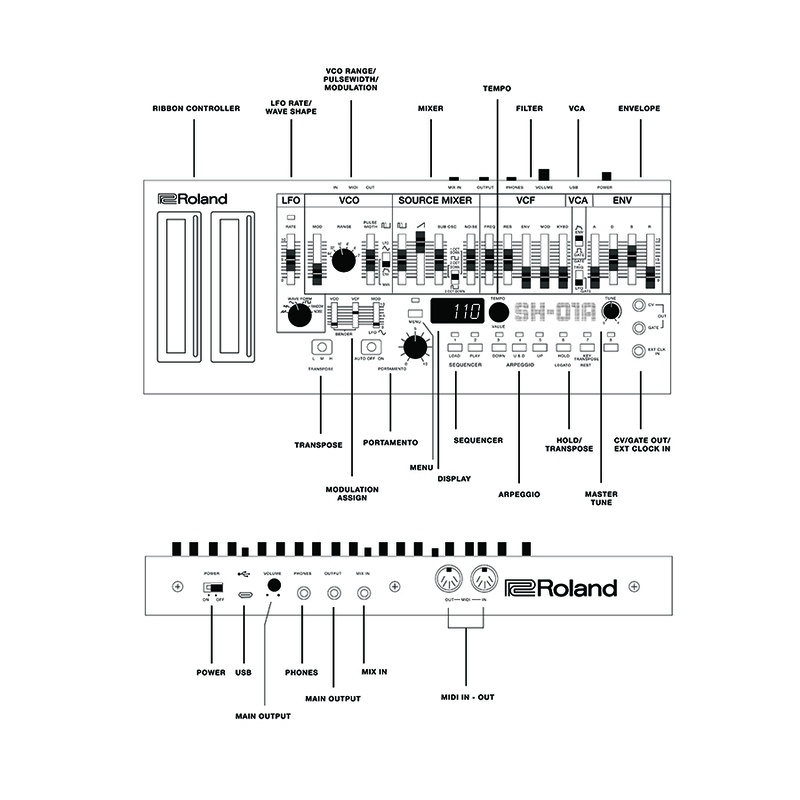 It’s also possible to control the transpose function of the SH-01A remotely from a midi controller or sequencer. A big THANK YOU from a very beginner in synths!!! I think I will understand more my SH-01A now!!! This and the SE-02 are amazingly done manuals! Thanks for the work you put on those!